Since the 1990s most scholars and historians have changed their views once they began opening up more archival records with growing interest into what happened to Armenians. Many questions started arising that cast complete doubt into the previously unchallenged allegation of an Armenian genocide committed by the Ottomans. The challenging questions have become inconvenient for Armenians who were once very convinced that they had experienced genocide. We'll go over just 10 of them that any rational person, would find that to call the events of 1915 genocide would be quite a stretch. 1. Why did so many Armenians receive assistance, food, money, resettlement land, tools if the intention was genocide rather than relocating hostile rebellious villages away from the Russian front line? This was also asked in the book by historian Yusuf Halacoglu: The Story of 1915 What Happened to Ottoman Armenians. It breaks down the settlements with 300,000 Armenians being settled in Deir-el-Zor (the city that Armenians claim is a desert even though it's a lush city right next to a river). 100,000 in Damascus and Maan. Despite gathering them all in a single spot, they were not exterminated as implied by Armenians. They were not exterminated before being transported to Syria either as Consul Jackson tells us that over 500,000 arrived in 1916. He also mentioned that 625,000 Armenians lived by 1921 in Syria. 2. If the goal of the Ottomans was extermination / mass-murder, then why weren't the thousands of Armenians in Western Turkey forced to migrate to Syria? The Ottomans didn't transfer Western Armenians because there were no rebellions in Western Turkey. All the rebellions were in the East and that was the front-line with Russia. Thus, as part of standard military strategy at the time, the Armenians were relocated from the East. Common Armenian counter-argument: The Western Armenians weren't killed because there were European Observers in Western Turkey. Well this wouldn't make much sense considering that European and US diplomats had free access to Ottoman-Syrian territory and reported on it frequently. But notice that they do not argue that they were killed. They know very well that the Armenian Patriarch of Constantinople stayed there and wasn't moved or killed. They know that around 300,000 Armenians living in Western and Central Turkey were not migrated and that the order of relocating them specifically mentioned Eastern areas near the front lines with Russia. 3. If the Ottomans exterminated the Armenians, where are all the cipher authenticated telegraphs ordering murder of civilians? There would be two copies, one for those carrying out the attacks and one in the archives. 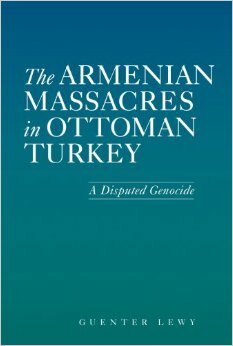 There would have to be thousands of orders coming from Constantinople for all the massacres that Armenians claim happened. All communications at the time were with telegraph. All orders MUST be authenticated with ciphers otherwise any spy could plug in their own machine halfway between Constantinople and the front-line and manipulate the Ottoman army into an ambush. Thus, there would be two copies of such orders and yet for 100 years no one has come forward having found such orders anywhere. Since genocide wasn't a crime back then and since the violent Ottoman Empire has a history of being ruthless having just suffered 8-10 million Turkish deaths in the Balkan wars of the 1800s, there was no reason for them to hide any such orders against disobedient Christians if it existed. 4. Where are all the anti-Armenian laws, hate speeches, or vitriol expressed against Armenians by the Ottoman leadership? Unlike in Nazi Germany with the Kristallnacht and various instances of Jewish hate laws and hate speeches. A whole book written by Germany's leader expressing his hatred for the sins of the Jews and how they were a threat to German Christianity. Nothing like that exists for leaders of the Ottomans such as Enver Pasha or Talaat Pasha. Instead we have plenty of orders written by Talaat Pasha expressing that Armenian migrants must be protected because they are taxpayers after all. Even orders to conscript them into the Ottoman army because they need their help against the Russians and Armenian rebels (of course, many Armenians would get conscripted and then desert the Ottoman army taking guns and ammo for the Armenian rebel organizations). There isn't even anything like the Wannsee Conference in Ottoman leadership, something that proved that the Holocaust was a genocide by the Nazi Germans. They had meetings to talk about how to deal with the dead bodies and how to rob them before killing them. 5. How did the Ottomans identify Armenians in comparison to Turks? Unlike in Nazi Germany, where Jews were given yellow stars of David to help identify them and force them into death camps. The Armenians were not given identification to single them out and harm them further. Simply rebellious Armenian villages were relocated from the front lines and then allowed to return once Russia withdrew in 1917 to deal with the Bolshevik revolution. It is impossible to tell the difference between Armenians and Turks unless you looked for circumcision or heard them speak their native language (although many Armenians spoke Turkish too). Or unless you saw them enter a church or heard their name. Otherwise they look completely alike. The main difference being that they were Christian with a different language. Instead, we have counter-evidence: Ottoman-Armenian governors. Yes, Armenians became governors under Talaat Pasha and Enver Pasha's rule. In fact, the very reason the CUP (ruling party) came to power is because they sided with the Armenian rebels and overthrew the Sultan. They were a progressive party against a conservative Sultan who treated the Armenians worse. This is not surprising since it is common for many Armenians to even accuse Ataturk (Turkish Republic's founding father) as taking part in genocide as well, who was also much more politically progressive and not very religious at all. It doesn't matter what Turkish or Ottoman leaders believe, but because they are Turkish--the Armenians believe they must have harmed Armenians. This is in itself a hateful ideology that was spread by the ARF (Armenian Revolutionary Federation) since 1915. Yet after 100 years, the ARF is still an active organization. One must ask why? Is WWI not over yet for Armenians? 6. Despite the British conquering Constantinople in 1918 and holding it for 5 years and looting the Ottoman archives. They uncovered no evidence of genocide or intentional planning of extermination of any minorities. Wouldn't there have been such evidence found by the British during their occupation? Even the Ottoman Empires' worst enemy, the British Empire, found no evidence of genocide. They certainly spread the propaganda of an Armenian genocide but they never once provided documentation nor archival materials stolen from Constantinople nor orders found indicating some heinous calamity was afoot as Armenians accuse. 7. How can you retroactively apply the term genocide when it became international law in 1948? If we're going to start applying things retroactively, then there were plenty of genocides we could start listing and start accusing the European nations. But we don't do that. Is it because we like Europe or hate the Turks? Common Armenian counter-argument: "Yes we can't apply it retroactively but Raphael Lemkin came up with the term to describe the suffering of Armenians." Yes but Raphael Lemkin is not a historian. How can he know that genocide took place against Armenians? He may have simply been duped by the Entente Power propaganda at the time which accused the Ottomans of massacring Christians (they didn't use the term genocide at the time). Finally, even if we used Raphael Lemkins' definition, then just about every war would suddenly turn into a genocide debate as civilians die in every war. His view of the term genocide is simply not correct because genocide is a term specifically reserved for intentional killing of a group. Besides Raphael Lemkins' reputation is problematic. As the definition now includes protection for religious, ethnic, national, gender groups. He didn't want "class" to be part of the genocide definition at the UN because he was persuaded (or paid) by the Soviets who exterminated people of certain classes. Yes, these are the questions we need to keep asking Armenian genocide supporters. They cannot continue to deny the atrocities committed against Turks while at the same time try to equate the Turks to the Nazis. It's just morally reprehensible. Jonathan, i can help you or atleast contribute some articles to this site, can you answer my messages ? This should be spread on every form of social media. What's even sadder is that some people in Turkey are starting to believe the Armenian BS. I'm just wondering why is it that people in Turkey are starting to believe these baseless claims. Perhaps it's because of the AKP espousing that the claims are baseless and they haven't had the best reputation in the world right now. But all the governments before them, and the general Turkish populace, still reject these claims. When all the evidence is examined, the Turks don't look like genocidal maniacs. But this seems more like racist attitudes towards Turks more than anything. I would venture to say that if someone tells a Turk that their ancestors were resposible for genocide, that person saying that is a racist. Rafael Lemkin thought the Potato Famine in Ireland also was a Genocide which is very hard to sell.. I noticed, in his CBS interview, he mentions watching the court proceedings and that he was very touched by the assassin's claims that his mother actually came to him and told him to kill Talat Pasha. He says he decided at that moment that this was a genocide. He clearly didn't know anything about the underlying history.